1. DOLLA DOLLA BILL, Y'ALL. The Coastal Commission calls San Mateo Creek "one of the most, if not the most, undeveloped and pristine coastal watersheds in Southern California." Rather than consider it priceless, the TCA offered a $100 million package to the California Department of Parks and Recreation to soothe the chafing-$30 million for various good works and $70 million to extend the San Onofre State Park lease from the Department of the Navy. Two problems: 1) The lease doesn't expire until 2021, and 2) there's no reason to suspect the Navy will charge the Department of Parks and Recreation any more than the $1 they charged for the first 50-year lease. So it's really a $30 million offer to destroy a state park. Here's a long list of photos and news articles from the "Surf Media". We set up an online petition to thank the Commissioners for protecting Trestles. It's very important that we thank decision makers when they do the right thing! This landslide vote was a watershed moment for the environmental movement and we need to make sure the Commissioners are positively acknowledged!It's super easy. Go here: http://www.thepetitionsite.com/petition/406462345 and sign your name. Surfrider will print up all the signatures and then hand deliver them at the next CCC hearing in So Cal. We are having a party next Saturday (Feb 23) at the OC Tavern to celebrate our win at the Coastal Commission hearing. We have three outstanding bands lined up (Bushwalla, Anna Troy and Austin Jennings). Plus, there will be a killer raffle…..and most importantly, all your friends who have helped protect Trestles and San Onofre will be there! Pass around the invite! BREAKING NEWS - CCC Says Toll Road Will Impact Surf Break! This just in… Surfrider Foundation has received a copy of an addendum that was just released by the California Coastal commission staff and submitted to the commissioners for tomorrows meeting. Again, this is the finding of the California Coastal Commission staff – an independent and non-partisan agency whose sole responsibility is to safeguard our beaches and coastlines, by enforcing the Califirnia Coastal Act. Don’t let Trestles be destroyed! Please attend the Coastal Commission hearing tomorrow and let your voice be heard! People attending Wednesday's hearing on the San Onofre State Beach -Orange County toll road issue won't have to pay the normal $9 parking fee at the Del Mar Fairgrounds, according to an update posted on the state Coastal Commission's Web site. Rob Field (in Ocean Beach/Point Loma--) 2525 Bacon St San Diego, CA 92107. Leaving promptly at 8:00am . This bus is full however we are setting up carpools here, so join us for a caravan!! Moreno Street Park and Ride (in Oceanside/Carlsbad—at I-5 and Hwy 78) 1928 Moreno St., Oceanside 92054. Leaving promptly at 8:00am. This bus is full however we are setting up carpools here so join us for a caravan!! Trestles Parking lot at leaving at promptly 7:00. We have limited space here, email Robin: robin.everett@sierraclub.org to get the last seats! But again, if the bus fills up, we will have a carpool organized. Trestles needs you to attend the Coastal Commission Hearing this Wednesday February 6, 2008! This Coastal Commission hearing is our chance to stop the Toll Road through San Onofre State Park and Beach. With last week’s passage of federal legislation requiring the TCA to comply with state law, a “No” vote from the California Coastal Commission would be a killing blow to the Toll Road. The hearing will start at 9am and will go all day. If you are not driving with our bus/carpool you can show up whenever you want. However, we'd like people there at 9am; and if you want to testify you need to turn in your speaker slip in the morning. It's difficult to say how long the hearing will last. Our goal is to keep the venue filled with our supporters throughout the day. Even if you can only make it for part of the morning or the afternoon, that would be great! If you are driving yourself, there is a $9 parking fee. However, thanks to the generosity of our friends at ASR and Dr. Know, we will be offering a few supporters (people who sign in at our booth) $5 in cash to help offset parking cost. This will be "on a first come, first served basis". Is there a way to keep up with the day’s events? Yes. The Surfrider Foundation will be webcasting updates using Twitter. 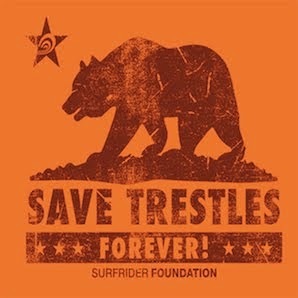 Simply go to www.twitter.com/savetrestles for real-time updates throughout the day. The Surfrider Foundation and projectBLUE will also issuing updates for those on site via cell phone using Pinger. Simply log on to www.betruetoblue.com/savetrestles to sign up for this service. Don’t Forget…..Surfrider is also offering prizes, including two hand-shaped Rusty Preisendorfer surfboards, to attendees who show up in the most creative and original "Save Trestles" themed outfits. If you are looking for or offering a ride down to the Coastal Commission hearing on Wednesday, please post your information here in the comments section.